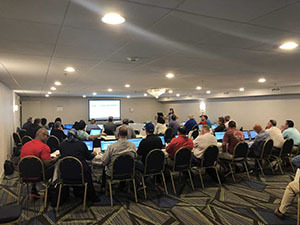 Local S&Ts gathered Oct. 8 to 10 in New Haven, Conn., for the first of five workshops about the TD Connect eBill system. November 12, 13 & 14, 2018 – Birmingham, Ala.SESSION FULL – REGISTRATION CLOSED, SEE WAITLIST INFO BELOW. November 27, 28 & 29, 2018 – Rosemead, Calif. SESSION FULL – REGISTRATION CLOSED, SEE WAITLIST INFO BELOW. Workshop sessions will run from 9 a.m. – 5 p.m. on all three days. Click here for a flier with specific workshop details. Space in these workshops is limited. A wait list is available for full workshops. For additional information about these workshops, call Alyssa Patchin at 216-227-5281 or email apatchin@smart-union.org. TD Connect is on its way, and you can get an idea of how the new eBill system is going to make recordkeeping for your local easier by checking it out early. Fill out this form to register for access to the demonstration version of TD Connect, which will allow you to try out the system. All 2018 paper (aka green-bar) bills must be submitted to the SMART TD office prior to gaining access to eBill. We recommend working through your December 2018 bill as soon as possible. Do not wait until the December 20th deadline! Local Treasurers must work to clear outstanding member variances. Local Treasurers must work to develop a system between your members, local chairmen, local president and local treasurer to gather dates required to process E-49 statuses. about the S&T’s roles and responsibilities? Visit the S&T Tools page on the SMART TD website for guidance on getting the job done! Call the Field Support Help Desk at 216-227-5444. Drop-in help desk hours are 9a-5p (Central Time) M-W-F. Help desk appointments can be scheduled in advance for Tuesdays, Thursdays, weekends, and evenings. Call or email fieldauditor@group. smart-union.org to schedule an appointment. • Nov. 5 — Registration closes for the Nov. 12 to 14 TD Connect workshop in Birmingham, Ala.
• Nov. 5 to 7 — TD Connect workshop, session 1, in Kansas City, Mo. • Nov. 7 to 9 — TD Connect workshop, session 2, in Kansas City, Mo. • Nov. 12 — Registration closes for Nov. 27 to 29 TD Connect workshop in Rosemead, Calif.
• By Nov. 14 — Quarterly Form OE-1a due at SMART TD office. A new version of WinStabs is coming in late December and coincides with the TD Connect eBill system’s debut. One major change for the new WinStabs, known as WinStabs-NMR, over previous versions involves the elimination of the billing process and member records, which go over to TD Connect. A single database will now house multiple years of data in WinStabs, and that will make it easier for S&Ts to access past reports if needed. Field Auditor Justin Fougerousse, a former treasurer himself, helped to develop and streamline WinStabs-NMR, which will now track savings and investment accounts to improve the accuracy of year-end and monthly reporting to membership. WinStabs software runs on Windows computers, specifically those with Microsoft Access or Access runtime (32-bit) 2010 or newer installed. Fougerousse recommends the use of Office 365, but the runtime version is available. Support for the program will be provided through an email link as well as the Field Support Help Desk at 216-227-5444. Documentation also will be accessible via the SMART TD website. There’s a better way to back up your important data, especially when it comes to your Local’s records. Cloud computing technology has made it easier than ever to ensure that you don’t get that sinking feeling when you’ve “lost everything” because the unexpected happened and a computer or device has failed. While thumb drives are inexpensive and a super portable means for backing up your data, there are drawbacks. Thumb drives are small and can be easily lost or forgotten. If left in a shirt or pants pocket, a thumb drive can end up going through a cycle in the washing machine and get ruined. And while cheap and readily available, thumb drives are not the most durable products. Wear-and-tear does happen, and they can fail without warning. This brings us to the idea of cloud computing, which refers to multiple computers, known as servers, that are linked together and accessible via the Internet for use by others. Cloud computing has enabled big advances in how the Internet works – if you watch streaming video or listen to a music stream online, you’ve taken advantage of cloud computing. With all those servers out there, there is plenty of free space available online for you to upload important files that would be accessible to you anywhere. That way, if something unexpected happens to your computer or device, you’ll have peace of mind and not have to be like this guy. He’s seen enough cases where a simple backup would have saved hours of work and anxiety. “A treasurer called me and told me that the Department of Labor is inquiring why the 2017 LM report due in March wasn’t filed,” Fougerousse said. “The treasurer said the local had a computer crash and lost all their 2017 data, then tried to rebuild it, but the bank statements would not balance. Some reliable cloud services include Google Drive, Microsoft OneDrive (which comes free with Office 365) or Dropbox, just to name a few. The key is to be systematic and establish a habit of saving your files often, including your backups, because you never know if or when a big crash will come. Q: What happens to my 2018 (or older) WinStabs data in 2019? 2018 and older WinStabs will still need to be kept as a backup because it is still a “local record.” Locals must use WinStabs version 5.09 (released in January 2018) to open 2018 and older data. Beginning in January 2019, locals will use WinStabs-NMR, version 1.0, to manage data from 2019 and on. WinStabs-NMR is a continuous database that will carry on from year to year that will be an easier way to keep a local’s records intact. Basically, locals should have WinStabs version 5.09 to open their 2013-2018 data backups on the computer, and the new edition, WinStabs-NMR, version 1.0, will house everything from 2019 going forward. To submit questions to Ask an Auditor, email fieldauditor@group.smart-union.org.